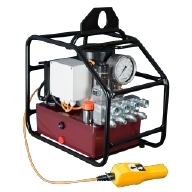 Titan offers a full line of electric/hydraulic torque wrench pumps to meet your every needs. EXE Titan pump range features a 3-stage piston design allowing the pump to be faster at any working pressure stage. Durable and efficient EXPRESS series pumps are made especially for repetitive bolting tasks in harsh environments.